Soy oil comes from soybean plants. It's a semi-clear oil, refined or unrefined and cleaned. It's a plant based oil, low in saturated fats with zero cholesterol. Soybeans are known as the “miracle crop” because they're high in protein and vitamins. Soybeans are one of the oldest farm crops. Farmers, in the USA, grew them back in 1829. Today, they're used around the world. Farmers plant soybean seeds in the Spring and harvest in the Fall. The average plant grows 3 to 5 feet tall. It has 60 to 80 pods, with 3 beans each. After harvest, some beans are brought to a factory to be cleaned and cracked. The outer shell of the bean, (hull), is removed. After removed, soybeans are rolled into flakes. When flakes are crushed, natural oil is removed. Food production, frying or baking. When baking, it's used as a substitute for some vegetable oils. It's used in salad dressings, breads, cereals, mayonnaise, margarines, chips, snacks and other foods. Soybean oil is used as a raw material in inks, crayons, paints and candles. Soy contains vitamins, minerals, protein, fiber and Omega 3 & 6 fatty acids, BUT not in every manifestation. The plant maturity, preparation, fermentation all affect the degree of nutrients. -- Vitamin A, (beta-carotene), is in fresh immature soybeans, but not in mature ones. -- Vitamins B are the most prevalent in soybeans. They do not diminish in preparation or oil extraction. -- Vitamin C appears in very small amounts only in mature soybeans. (Most preparations will totally eliminate the vitamin C). -- The vitamin E content varies with the soybean type and preparation. -- Soy contains phytosterols, plant compounds with antioxidants. Dr. Oz states, "When you’re shopping, look for whole soy foods over isolated soy protein powders like fake meats with soy isolate. Try eating tofu, tempeh, soy milk, edamame and soy nuts. They’re good sources of protein and help guard against hormonally driven cancers, such as prostate cancer and breast cancer." ATTENTION! The abbreviation GMO means "genetically modified organisms". In North America 75% to 89% of soybeans are genetically modified, (GM soy.) Manufacturers produce GM foods to enhance taste and quality, increase nutrients or resist pests and disease. GM soy is in approx. 60% of processed foods. CAUTION! Scientists report findings of toxicity and cancer-promoting properties in GM food. Many European countries are now looking to ban GMO products. European laws require labeling on GM foods, so avoiding them would be easy. 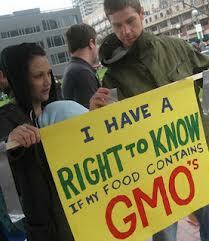 Food manufacturers in the USA and Canada are not required to label their food genetically modified or not. There are two types of soybean oil used for making soap; hydrogenated and non-hydrogenated. Whether using hydrogenated or non-hydrogenated oil will not change saponification values. They remain the same. Non-hydrogenated oil offers better conditioning properties, but less lather in a bar of soap than one made from hydrogenated oil. Both can offer moisturizing properties with very low, creamy, lather. SOAP MAKING TIPS: Soy oil is a neutral, filler, oil. Use 100% soy oil combined with other soap making oils, like coconut or olive. Combining it will help make a stable, bubbly, lather. Use 100% soy oil as a portion of your soap recipes, from 5% - 10%. Do not use a high percentage. For best results use the highest possible quality of oil. Combine 100% soy oil with lathering oils for conditioning and moisturizing properties. 100% soy oil is low in cost, making it economical when making large soap batches. Use it as a base oil for added bulk in a soap recipe. 100% soybean oil can be used alone for making soap BUT you may not like the results! Using it alone can produce a soft, gritty or slimey soap. This homemade soap will have little or no lather. CAUTION! SOAP MAKERS, PUT THAT CRISCO DOWN! 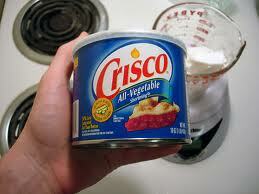 Vegetable shortening, like Crisco, is made out of soybean oil, palm oil or a combination of both. Soybean oil and palm oil are a nice complement to each other for making homemade soap BUT in vegetable shortening, like Crisco, you don't always know how much of each oil is included. If you don't know the amount of each oil included, then you don't know how much lye to use. This will make a HUGE difference in the results of your soap bars. EXAMPLE: If you're making a 5 lb oil batch and the ratio of soy to palm is 1:5, then you will need 12.85 oz. lye to get a nice hard bar. On the other hand, if the ratio of soy to palm is 5:1 then you will need 12.45 oz. of lye to get a very soft bar. ATTENTION! You MUST know the amount of each oil in the shortening used. You may find 100% soy Crisco. You may find 100% palm oil Crisco. You may find a mixture of both, palm and soy, with no amounts mentioned. You may find "vegetable oil" listed as an ingredient on Crisco, but no mention of whether it's hydrogenated soy, corn, cottonseed, coconut, palm or canola. It could be any of these in any combination. You WILL NOT get consistent results. Other Crisco ingredients may be sugars, (mono and diglycerides). These may cause acceleration depending on how much is included. You will not know the amounts of sugars used. Other Crisco ingredients may be TBHQ and citric acid. These antioxidants may affect soap, slightly. 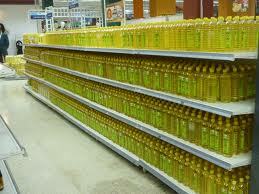 SHELF LIFE / STORING: 100% soy oil has a shelf life of approximately one year. Store it in a cool, dry, location, away from heat. It can be stored at room temperature, but only for a few months. Refrigeration can help extend endurance.